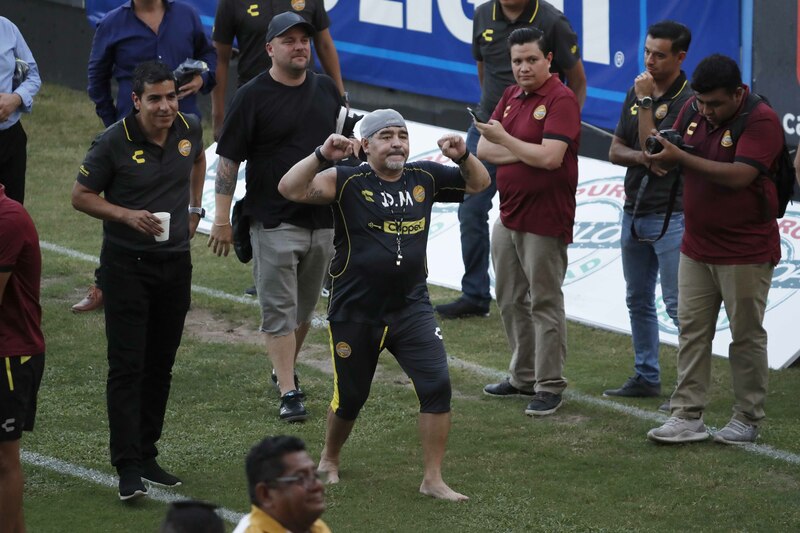 Former soccer great Diego Maradona says goodbye to the fans in stands, after a training session at the Dorados de Sinaloa soccer club stadium, after Maradona was presented as the new manager of the Dorados in Culiacan, Mexico on Monday. Argentine legend Diego Maradona described his decision to coach second-division Mexican club Dorados as a rebirth after years battling addictions, as he officially became the team's new manager Monday. Maradona, who has publicly struggled with drug addiction, alcoholism and obesity, raised eyebrows with the decision to accept a job in the heart of Mexican drug cartel country - the rough-and-tumble state of Sinaloa. But in his first press conference for Dorados, he described the job as a healthy new beginning after a long "sickness," alluding to the excesses of his past. "I want to give Dorados what I lost when I was sick," he told the 200 journalists who packed the hotel conference room in Culiacan, the state capital, where he was officially presented as the struggling club's new coach. "I was sick for 14 years. Now I want to see the sun, I want to go to bed at night. I never even used to go to bed. I didn't even know what a pillow was. That's why I accepted the offer from Dorados," he said. Mexico was the scene of Maradona's greatest triumph as a player: leading Argentina to the 1986 World Cup title - almost single-handedly, according to some. But he surprised the football world with his decision to coach a second-division team who are currently in 13th place in their 15-team league. Jokes soon broke out online about his choice of destination: Sinaloa is perhaps best known as home to the drug cartel of the same name. And Dorados are owned by a politically powerful family, the Hank clan, that has been accused of links to drug trafficking. Maradona, however, insisted his focus is on football, calling this "the best moment in my life."